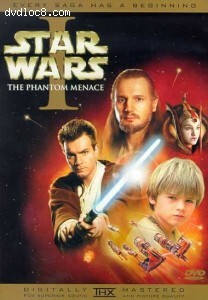 This page contains easter eggs for the disc Star Wars Episode I: The Phantom Menace (Widescreen) (DVD, Region 1). On Disc 1, during the "Attention" screen, press the 'Audio' button on your remote control for a 'Naboo' based menu or press '2' for a 'Tattooine' based menu. On Disc 1, from the "Options" menu, using your remote, enter '11' (or '10+' followed by '1'), press enter, then enter '3', press enter, then press '8', press enter. On Disc 2, from the "Deleted Scenes and Documentaries" menu, go to "Deleted Scenes Only". Once you have reached the page entitled "Complete Podrace Grid Sequence", highlight "Doc Menu" and press right to highlight a small square. Hit enter to view a short featurette on this scene. Now, advance to the next deleted scene page, entitled "Extended Podrace Lap Two". Just like before, highlight "Doc Menu" and press right. Now hit enter to view a short featurette about this particular scene.